Celebrating Mozart�s 250th Birthday, this 2 disc set not only includes some of Mozart�s best known compositions such as Eine Kleine Nachtmusik, Symphony No 40 and Piano Concerto No 21, but also includes a bonus CD ROM disc packed with entertaining and educational music related games and puzzles. 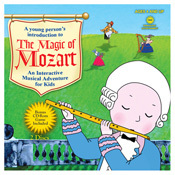 It�s the perfect fun, creative and educational way to introduce your child to and help develop an appreciation for the treasures of classical music. Your child will learn and recognize these famous musical selections while they delight in playing the innovative music games. Help your kids develop skills in memory, sound discrimination, logical thinking and recognizing musical instruments.